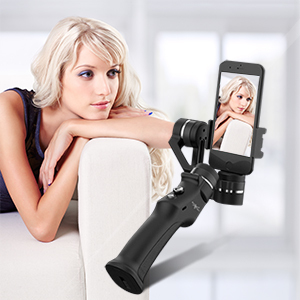 Become a Content Creator with that Gumball for your smartphone ! Pan Following Mode - The smartphone pans left/right following the movement of the stabilizer while the tilt and roll axer are locked. Push the joystick up/down allows manual control of the tilt axis. Following Mode - The camera pans and tilts following the movement of the stabilizer.Push the joystick left/right allows manual control of the roll axis. Locking Mode - This mode locks movement of all three axes to keep the camera still and stable.Push the joystick up/down and left/right allows manual control of the roll axis and pan axis. Portrait Mode - Rotate the Eyemind 90 degrees to the left or right to go from Following Mode to Portait Mode.Active Track is disabled when using Portrait Mode. Universal 1/4 inch screws design to mount the camera more conveniently. Power on and off with a beep that can be heard clearly outdoors. Battery flat top is universal in scope. Two hours to get a fully charged battery that could work 8 hours. Super long working hours without fear of no power. 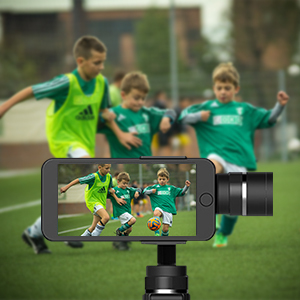 · Intelligently follow pre-set route in auto-rotation mode, fit for motion time-lapse or automatic shooting. · Manually lock the angles of two axis in three working modes without missing any splendid moments. 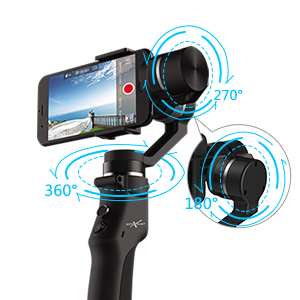 · One button to quickly enter lock mode and reset the gimbal in a key. · Quick upgrade, set up the parameters, calibrate, reset and virtual remote control with APP. · Several working mode make most of the videos easily to be done. 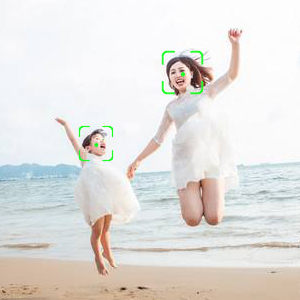 Eyemind, with face recognition and tracking technologies, locks your face instantly and shoots pictures automatically. Working well the same in individual, dual and nultiplayer scenes. 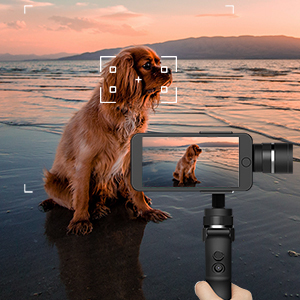 Eyemind automatically recognizes subjects, follows and captures them as they move, making it easier to get copmplex shots. Eyemind supports advanced shooting techniques, realizes features such as Timelapse, moving time lapse, Freestyle time lapse and continuous beat 180D Panoramas. 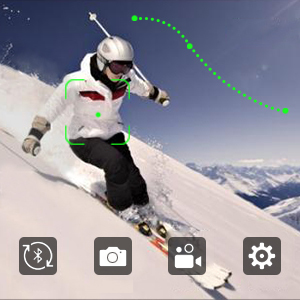 With gopro board, eyemind is suitful for Action camera. Eyemind is powered by advanced FOC drive algorithm, integrated with high-precision gyroscope and magnetic coded dual sensor, giving you smooth and steady motion pictires made by smartphone. Eyemind is with one button to quickly enter lock mode and reset the gimbal in a key. Detachable handle to freely switch in installation ways. Quick upgrade, set up the parameters, calibrate, reset and virtual remote control with APP. Eyemind can produce smooth footage and also track objects including but not limited to human faces with much higher precision. You can frame the object you want to track on the screen, and the stabilizer can recognize and track. Eyemind discovers more than just yourself, a chance to meet with confidence. 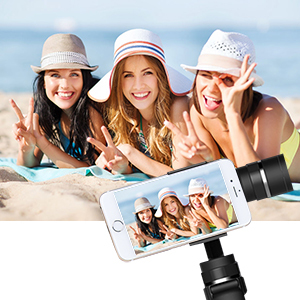 Triple Click continuously, to vertical photo taking mode. After clicking, slanting handheld 45D to the left to start vertical photo taking; then triple click another time, slanting handheld 45D to the right to off vertical photo taking. About photo button: press it to start quickshot; Press it with two seconds to start video; another two seconds to stop video. Two hours to get a fully charged battery. 1. Enable bluetooth and turn off portrait orientation lock on your mobile phone to allow horizontal screen display. 2. Power on the Eyemind. 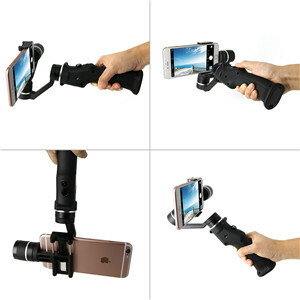 When it is starting up, please do not touch the gimbal and hold the Eyemind handheld for stable. 3. Search the Eyemind "Capture" through phone Bluetooth, then connect it. 4. Running Capture APP to connect to Eyemind as tips. Attention please: The video or smart following function will be stopped if there is a call. Accept ios & Android. ios users. iOS users find the application in APP Store by searching "Capture Move", Andriod users can find the application in Google Play Store by Searching "Capure Move". TIPS: The application requires phone operating system version above iOS 8.0 or Android 4.4.